My days have regular rhythms, as yours probably do. In the morning, I’m usually fresh and energetic. The afternoons are sometimes a little slower, but they’re often solidly productive. In the evenings, my mind is a bit tired, but it’s a good time to catch up on chores. I’m slowly learning about the quirks of my rhythms and choices. I’ve been thinking about what’s good to do when so that I can find better ways to use my time. If I commute off-peak, I can sit down and write or play games. It’s easy to time this in the mornings. I often plan to avoid the evening rush, but I get stuck in it anyway. This is because I get distracted by cool things to work on or learn. Maybe I should set an alarm. If I sit on the couch, one of the cats will usually settle onto my lap. This makes typing on a laptop inconvenient. But I enjoy spending time with the cats, so I don’t mind giving up a little productivity. It’s relaxing to focus on the cat instead of multitasking, and sometimes ideas float into my head. When I want to work on something, my phone can be more convenient than my laptop. If I do a coding sprint close to midnight–say, from 9:30 PM to 11:30 PM–I have a harder time falling asleep, even if I’m no longer thinking about code. If I spend the same time writing, even on my computer, I’m fine. Geeking out with W- is a good way to spend evenings. Brush up tech skills, spend time together, make the house a little smarter. I hadn’t realized how similar cat-couch-time is to commuting time. I should be sure to keep my phone handy. Differences: drawing on my tablet PC is something that makes decent use of cat-couch-time that I wouldn’t do while commuting, and I can listen to podcasts while commuting but I’d rather listen to purring when with the cats. Hmm. 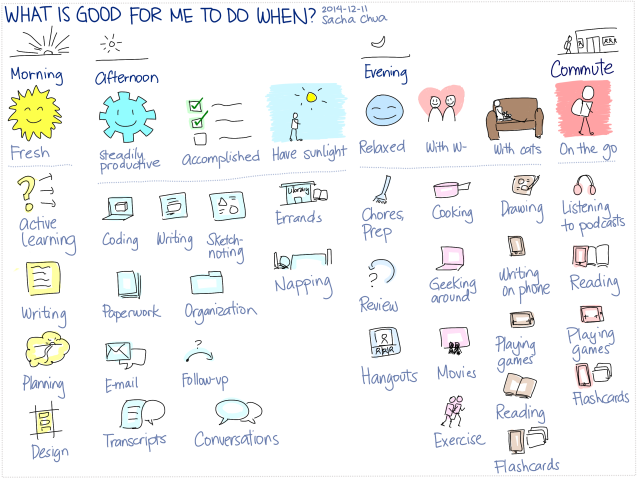 This gives me a way to practise using my time better during each phase of my day. I might print this and keep it handy, or bookmark it and refer to it often. What would your rhythm look like?